For the last 3 days, I was guiding two really great guys from Oklahoma. They had fly fished around, buy steelheading was not in their resume. At first, getting the guys used to switch rods was the first line of order. Luckily switch rods are so user friendly; so they were banging out casts into likely holding lies in hopes of chrome. Now it was just a matter of having a fish intercept their offerings. It turns out that their timing was very good; since the water was very low for a long period of time, and a new freshet was here bringing some new smells into the water to pull in a new fresh batch of steelhead to ascend to their natal spawning grounds. On top of that, the chances of a very large native fish are always present this time of the year. It turns out that the "big fish" gods answered our call, and both of the anglers got to experience a fish of a lifetime. One day Charlie hooked into a chrome bright hen that took him literally about 500+ yards downstream over a double stair step water fall, and down through boulder strewn set of rapids, and into a long pool to have the fish take the whole fly line 3 more times (with the drag cranked down). When we were standing there getting ready to net (rubber net) the seemingly over 40" chromer with the leader cranked into the rod, the fish gave one last pull, and snap! She was back off to continue her run.....Luckily, we saw this awesome beast, and she was the largest fish I have seen in person (steelhead-wise), and she was in close and personal several times. The only thing we did not get to do was to scoop it, take pics, and maybe measure it under water. Otherwise, she gave us the entertainment of a lifetime! Charlie was super stoked on that amazing fish and crazy battle he endured with the fish. We ended up having several other fish, but those two were the standouts on the trip for Charlie and Bob. It was pretty crazy to think and be able to confirm how large Charlie's fish was. 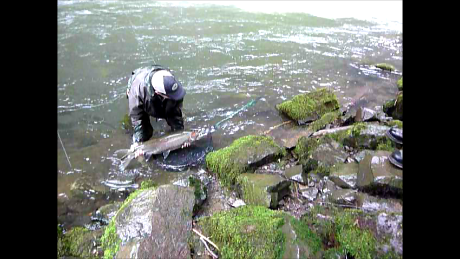 It was a good bit larger that Bob's landed male steelhead. The huge fish Charlie had on was chrome bright, wild, and so angry that it took us through the craziest battle I have seen so far for steelhead, or any fish for that matter! It just shows that when you though you have seen everything, you haven't seen it all! great report. thanks for keeping us in the loop with your fishing exploits. keep up the good work. nice job brian,those are some gorgeous fish!!!! !